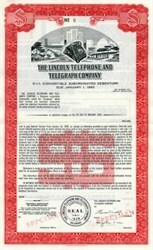 Beautifully engraved SPECIMEN certificate from the Lincoln Telephone and Telegraph Company. This historic document was printed by the Northern Banknote Company in 1979 and has an ornate border around it with a vignette of an old dial telephone in the foreground and a residential and city in the background. This item has the printed signatures of the Company's President and Secretary. The Lincoln Telephone and Telegraph Company provided local, long distance, wireless, data communications and internet services to the Southeast one-third of Nebraska during a time period in excess of 75 years. Lincoln Telephone became Aliant Communications in 1997.